When home theater started taking off, many manufacturers of traditional 2- channel stereo amplifiers didn’t know how many channels to include in their new home-theater amps. Should the amplifier have three channels to power the center and surround channels, leaving an existing stereo amplifier to serve the main left and right loudspeakers? Or was five the right number of channels to drive the left, center, right, and two surround channels? Or perhaps six channels were better so you could drive a subwoofer, as well? But what if you had a powered subwoofer that didn’t need an external amplifier? And suppose you had two passive sub- woofers and required seven amplifier channels for the system? Marantz solved this quandary with a simple and elegant solution: build a single-channel or “monoblock” amplifier and let customers buy as many as they need. This is the philosophy behind the Marantz MA500 125W THX-certified monaural power amplifier. And don’t worry about a stack of amplifier chassis dominating your home theater; the MA500’s slim design lets you put up to five MA500s side-by-side in a space no wider than most 2-channel power amplifiers. The MA500 is a perfect match for Marantz’s AV600 A/V preamplifier/ tuner; both products are THX certified, and complement each other visually. You can also turn the MA500s on and off from the AV600’s remote control. The AV600 incorporates a tuner, pre amplifier, and Dolby Pro Logic decoder in one chassis. The Pro Logic processing is performed digitally for the rear channels, with analog processing for the front channels. This hybrid approach reportedly results in better sound. The analog and digital processing sections are performed on separate circuit boards for isolation. This combination of analog and digital processing is also used in ultra-high-end A/V processors. The AV600 provides full THX processing, which means three circuits are added following the usual Pro Logic processing: re-equalization (a treble rolloff surround decorrelation (makes the monaural surround signal slightly different to the left and right surround loudspeakers); and timbre matching (equalization to assure that the front and rear loudspeakers have the same tonal balance). I’ve found that this THX processing is a big improvement over straight Dolby Pro Logic; it makes watching movies more involving. Although the AV600 has no internal provisions for an AC-3 upgrade, Marantz does have an upgrade path in mind. 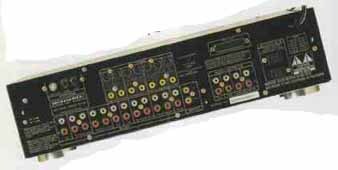 The DP-870 Dolby AC-3 De-modulator/Decoder ($700) is a stand alone unit that connects between the preamp outputs of the AV600 (or any other processor) and the power-amplifier inputs. Bypassed completely when listening to non-AC-3 sources, the DP-870 automatically switches on and takes control when it receives an AC-3 signal at its RF input (from a laserdisc player) or direct digital input (from a DVD player). You can connect two VCRs plus three other A/V sources to the AV600. All video inputs and outputs are provided on both composite and S-video jacks. One of the AV600’s best features is a “smart” input switching circuit that chooses the correct mode for the input selected. For example, out of the box, the AV 600 automatically calls up THX/Pro Logic mode when a video-oriented input (VCR 1, VCR2, LD) is selected. If you then switch to a different mode, say, Pro Logic or Stereo (no Dolby processing), your selection is memorized and recalled the next time you select that input. Music sources work differently. Each time you switch to CD, analog cassette, or tuner, the AV600 always automatically goes into Stereo mode. If you want to listen to a music source in surround, you can of course punch up your mode of choice. However, the new mode will not be memorized. This great feature prevents incorrect decoding for the majority of A/V pre amp users who don’t always remember to switch from Pro Logic mode to Stereo mode when playing music. Another thoughtful feature is the ability to preset two different sub-woofer levels that are automatically selected when changing surround modes—a higher subwoofer level for home theater and a more natural-sounding bass for music. This assures plenty of bottom end for video soundtracks, yet prevents music from sounding boomy. A rear-panel switch selects between “large” and “small” center-channel loudspeakers (also known as the Wide and Normal settings). 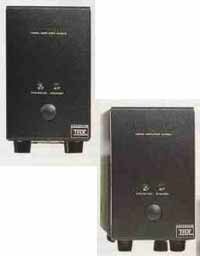 A second switch selects between stereo or mono sub-woofers, or no subwoofer. When the subwoofer switch is set to either Mono or Stereo, the AV600 rolls off the bass (an 80 Hz, THX-specified high- pass/low-pass filter is built in) to the front, center, and surround channels. This keeps low frequencies out of your main loudspeakers, which provides greater clarity and better dynamics. It also increases the system’s ability to play loud without distortion, and it protects your loudspeakers from damage. By putting these setup switches on the rear panel, there’s no chance of inadvertently changing the setup by pressing the wrong button on the remote control. Input-source selection is via a row of tiny front-panel push buttons. A second row of push buttons beneath the AV600’s flip-down panel controls the tuner, delay time, and tape copy functions. Bass and treble controls, as well as an input-level adjustment, are provided on easy-to-use knobs. On the review sample, the flip-down panel tended to get stuck in the closed position, requiring a strong pull to open it. 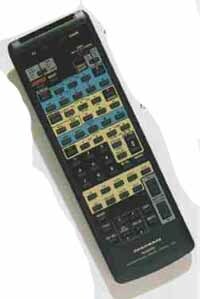 The AV600’s programmable “learning” remote control is decidedly less friendly than the Denon AVP-8000’s. (See my review elsewhere in this issue.) Although the Marantz remote has colored backgrounds to group similar functions, the small buttons are all the same size, shape, and color (except the often-used master volume). As an added bonus, send Marantz the postcard provided with the AV600’s owner’s manual, and you’ll receive a free copy of Lucasfilm’s coveted Wow! demonstration laserdisc. Familiar to anyone who attends trade shows, this useful disc contains clips from the Star Wars and Indiana Jones movies, as well as Willow. The disc also includes audio and video test signals for calibrating your system, and explanations of soundtrack production and THX home-theater technology. The AV600 is a well thought-out de sign from top to bottom. It’s obvious that a lot of real-world knowledge about how an A/V preamp is used went into its design. The combination of analog and digital Pro-Logic processing, automatic mode switching, and extensive inputs with sophisticated copy features all point to a fully realized design. The MA500 amplifier puts out a hefty 125W into 8 ohms, and 180W into 4 ohms. These figures are RMS, and with less than 0.05% and 0.09% distortion into 8 and 4 ohms, respectively. Many home-theater amplifiers claim higher power than they actually produce by rating the amplifier into a lower impedance, with a high distortion figure, and at 1 kHz. The MA500’s 125W power rating is a true figure. More over, because the MA500 is a single- channel amplifier, we know that the 125W power rating is with all channels driven simultaneously. (Multichannel amplifiers often share a power transformer between channels, reducing each channel’s output power when more than one channel is driven.) In addition, monoblocks confer the advantage of total isolation between channels, with no crosstalk or other interactions to degrade sound quality. And if you need more power than the MA500’s 125W into 8 ohms, you can bridge two MA500s for a whopping 450W RMS into 8 ohms. The MA500 is simple and straight forward to connect and use. In addition to RCA input jacks and loudspeaker output binding posts, the MA500 has a pair of RCA jacks marked “D-Bus” that let you turn on and off the five amplifiers from the AV600’s remote control. Just daisy-chain the amplifiers with the supplied orange RCA cable and connect one amplifier to the AV600’s D-Bus jack—this saves you from having to turn on and off each amplifier individually. The MA500’s circuitry is mounted vertically rather than horizontally. Two pairs of output transistors are attached to a vertical heatsink that consumes a sizable portion of the amplifier’s internal volume. The transformer is of good size, contributing most of the MA500’s 13 pound weight. A micro processor-based protection circuit pre vents the amplifier from overloading, monitors any direct current at the out put, and shuts down the amplifier if the outputs are shorted. This protection system is designed to make the MA500 virtually destruction-proof. I had used a Marantz AV500 processor (a model below the AV600) and five MASOO amplifiers in my home-theater system for about a year before this review. The Marantz package drove the NHT VT1 and Snell Value Music and Cinema systems before seeing action recently with the In- fin it y Compositions package. Some of the auditioning was with a REF AV THX subwoofer. Source components included Sony MDP 600 and Yamaha CDV-W901 LD players. Rather than use the LD players’ analog outputs, I took their digital outputs into an Audio Alchemy DTI V2 jitter attenuator, then into Audio Alchemy’s DDE V3 digital-to-analog converter for better sound quality. Replacing your LD player’s D/A section with a higher quality outboard converter is a big upgrade to your system. I tried the MA500s with the Denon AVP-8000 AV preamplifier/tuner, and compared the MA500s to the other amplifiers I reviewed for this issue, including the Audio Design Associates PTM-6150 and the Denon POA-8200 and POA-8300 amplifiers; all of these amps are THX certified. I also put the AV600 and a pair of MA500s to the test in my separate music-listening room where it was mated with superlative equipment, such as a Mark Levinson No. 31 CD transport, Spectral SDR-2000 Pro digital processor, Avalon Radian HC loud speakers, and MIT cables and interconnects. Using the AV600 and MA500 in a reference-quality system allowed me to better judge the Marantz’s musical qualities. In both the music and home-theater rooms, the MA500s were impressive. A pair of MA500s drove the demanding Avalon Radian HC loudspeakers without strain or congestion—even with out bridging. I was surprised at how good these amplifiers sounded in an audiophile setting. They were smooth, spacious, and had good dynamics. The MA500s were considerably better sounding than the ADA PTM-6150, with a more refined treble, tighter bass, wider soundstage, and a more musical rendering overall. 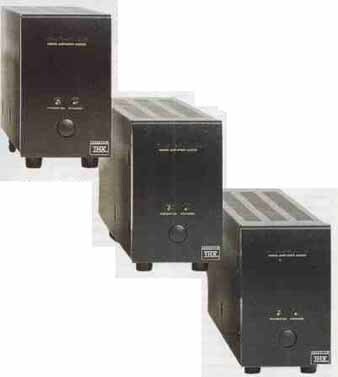 The $1000 Denon 2-channel POA-8200 THX certified power amplifier had deeper and more controlled bass than the MA500s, but the Marantz amplifiers had a larger soundstage and a more spacious presentation. A $600 pair of MA500s is an excellent choice for an audiophile-quality 2-channel system. The five MA500s and an AV600 driving the Compositions loudspeakers on video soundtracks were similarly good. The AV600’s smoothness was a big plus, taking the edge off the often hard-sounding soundtracks of many videodiscs. I thought, however, that the AV600 was less detailed in the treble than the considerably more expensive Denon AVP-8000. The AV600 had a somewhat subdued treble that lacked top-octave air. This characteristic also tended to make the AV600 sound less detailed. The AV600’s surround performance was the best I’ve heard on my system. The combination of the AV600 and five MA500s produced a remarkable sense of envelopment and immersion in the soundtrack. I had a greater feeling of being inside a continuous three-dimensional soundfield rather than hearing sound from the front and rear. The sense of diffusion from the surround channels was outstanding, particularly in the THX mode. Moreover, the surround channels were clean and quiet when no signal was present, and highly detailed. The AV600 also had a tight and coherent spatial presentation, with precise localization of front sounds within a large overall sense of space. The AV600’s surround quality was considerably better than any of the A/V receivers I’ve reviewed, and even a notch above the much more expensive Denon AVP-8000’s excel lent surround decoding. The Marantz AV600 preamp/tuner and MA500 power amplifiers offer terrific performance at a reasonable price. The AV600 is very well thought-out and loaded with intelligent features that make it easy to get good sound from your system. Its surround performance was second to none, with a wonderful spatial presentation and sense of envelopment when reproducing video soundtracks. The MA500s were also excellent, offering solid build quality, ability to drive demanding loads, and audiophile-quality sound. Moreover their single-channel design lets you buy as many as you need to fit your system. At $300 each, the MA500s are one of the best buys in home theater, and a better value than the $2500 Denon POA-8300/POA-8200 pair or the $2000 ADA PTM-6150. Despite my enthusiasm for this Marantz package, the system had a few drawbacks. The AV600 tended to be less detailed in the treble than I would have liked. The preamp also had a trace of midrange grain not heard through the AVP-8000. These minor shortcomings were apparent only in critical comparisons with the three- times-the-price Denon AVP-8000, and didn’t stand out on their own. Nonetheless, the $2700 Marantz package is a solid bargain. The AV600 and MA500 offer much better performance than A/V receivers, yet cost considerably less than many separate pre amp/power amplifier packages. The frequency response, signal/noise ratio, and distortion results were all excellent. Clipping (1% THD+noise at 1 kHz): 147W into 8 ohms, 220W into 4 ohms, and 230W into 2 ohms. Would only sustain instantaneous drive into 2 ohms (fuse blew with longer attempt).